Beginning with the year 2007, carbon offsets have been purchased to mitigate the environmental impact of the Getgreener.org web operations, and those of related projects like Transnational Temps. Because there is so much greenwashing these days — corporations using advertising to assert a green image where none is deserved — the records concerning this policy can be viewed below. In many recent years the CO2 offset dollars have been directed to projects that double as social welfare programs. But in light of the fact that other species are often even harder hit by CO2's climate-changing effects, this year's donation is to the World Wildlife Fund. The carbon footprint has increased slightly, but it is a family of three now, so it's not surprising that use has gone up a bit. I'm not really sure what the World Wildlife Foundation will do with our $20 donation, but I hope it balances out some of the CO2 we've put into the atmosphere this year.. Thank you Microsoft Rewards Program for incentivizing contributions to the WWF. After a few years of neglecting this carbon offset project, it's time to get back on the good foot. I used 1,360 kWh of electricity. It appears that the shift to a more efficient server has cut down on electrical use. Yay. 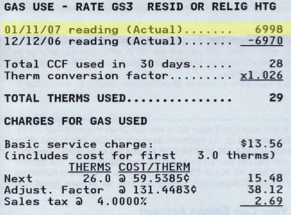 Regarding gas use, I will stick with my reasonable assumption that I'm using less gas with the shared boiler than at my old place where my apartment had two boilers. So I'll keep paying for the therms I used in my old apartment. So my carbon footprint related to home (and server) electricity and gas use are down to one and a half tons. 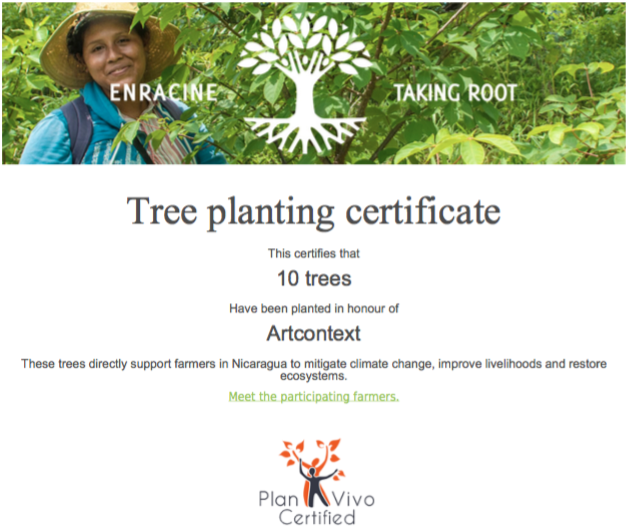 TakingRoot.org provides a carbon offsets in Nicaragua for roughly $5 per tree in a program that is also designed to alleviate poverty. Using the site's carbon footprint calculator as a guide, I financed 10 trees. The Taking Root certificate for purchased offsets is reproduced below. This was my second full year at the new apartment. I used 2,341 kWh of electricity. A bit more than last year. I will try to cut down this year. Rather than dig through the co-op's gas bills to figure out what 1/15th of it is, I will stick with my reasonable assumption that I'm using less gas with the shared boiler than at my old place where my apartment had two boilers. So I'll keep paying for the therms I used in my old apartment. If I end up with the gas numbers handy at some point, I'll check them. So my carbon footprint related to home (and server) electricity and gas use come to two tons. COTAP.org provides a ton of carbon offsets in Nicaragua for $8.80 through a forest replanting program that is also designed to alleviate poverty. Four extra tons of offsets were added to cover air travel, bring the total offsets purchased to 6 tons. COTAP does not presently provide any certificates for purchased offsets, so I made a graphic describing the offsets purchased below. This was my first full year at the new apartment. I used 2,244 kWh of electricity. A bit more than last year. I will try to cut down this year. Rather than dig through the co-op's gas bills to figure out what 1/15th of it is, I will stick with my reasonable assumption that I'm using less gas with the shared boiler than at my old place where my apartment had two boilers. So I'll keep paying for the therms I used in my old apartment. If I end up with the gas numbers handy at some point, I'll check them. So my carbon footprint related to home (and server) electricity and gas use come to two tons. 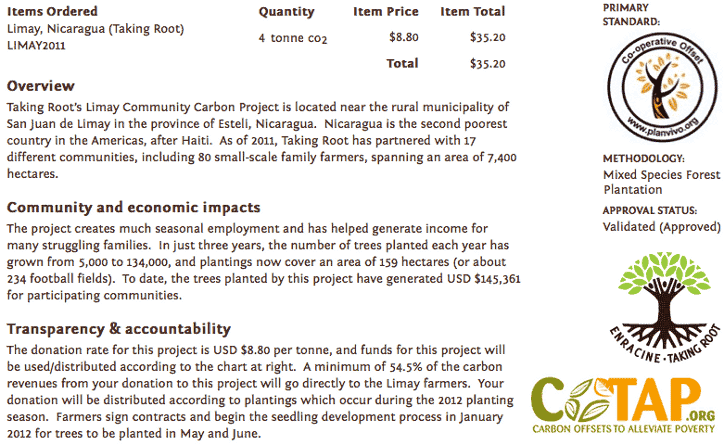 COTAP.org provides a ton of carbon offsets in Nicaragua for $8.80 through a forest replanting program that is also designed to alleviate poverty. Two extra tons of offsets were added to cover air travel, bring the total offsets purchased to 4 tons. By comparing my utility bills from early 2010 (after my move) and early 2011, I was able to discern that I'd used 1,831 kWh of electricity. Estimated usage from the 45 days at the old location was 320 kWh. Gas is metered collectively now. Because there's only one boiler for a group, it stands to reason that it's more efficient than my old personal boiler. However, I need more time to obtain and digest the relevant bills and make the calculations, so I will use last year's gas numbers again. CarbonFund.org suggests a $49.88 offset for 11,000 lbs. of CO2. Rounding up from 3936.378 lbs., I purchased carbon offsets for 3966 lbs. of CO2 from CarbonFund.org, a 501c3 non-profit organization for 2009. I used frequent rider miles to buy offsets for this carbon footprint. Unfortunately, Amtrak and CarbonFund do not provide certificates when the offsets are purchased this way. In fact, I had to write to the parties involved to ascertain whether the proper amount of offsets had in fact been purchased because the lousy response email showed less offsets than I'd agreed to buy when I clicked Submit. After receiving only a superficial reply from the marketing department, I waited a month for replies from both Amtrak and CarbonFund.org. Since neither replied, I sent documentation to the Better Business Bureau of New York State. The lack of an adequate paper trail in this type of donation system is insufficient and I would like to see the Bureau put pressure on these types of operations to be more transparent about their operations. 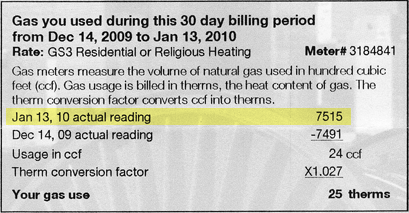 By comparing my utility bills from 2009 and 2010, I was able to discern that I'd used 2,490 kWh of electricity and 164 therms of natural gas. 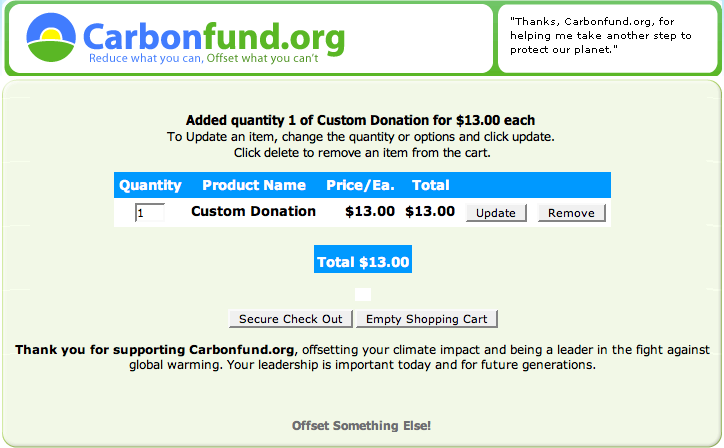 CarbonFund.org suggests a $49.88 offset for 11,000 lbs. of CO2. At this rate ($0.0045/lb. ), $19.52 should cover 4305.888 lbs. Adding $7.48 for two recent flights, I donated $27.00 to their 501c3 non-profit organization for 2009. It has been reported that renewable energy industries are having a lot of trouble in the present economic climate, which means that the necessary changes to the energy production processes that exist today are slowing down. Clearly individuals have a responsibility to do their part to reduce energy consumption. Through conservation, mostly, I reduced my power consumption over 2008 levels. Although I continue to cultivate a rooftop garden, I know I can do more and will try to do better this coming year. 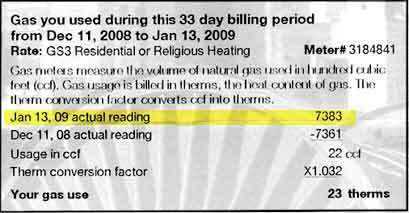 By comparing my utility bills from 2008 and 2009, I was able to discern that I'd used 2,330 kWh of electricity and 164 therms of natural gas. 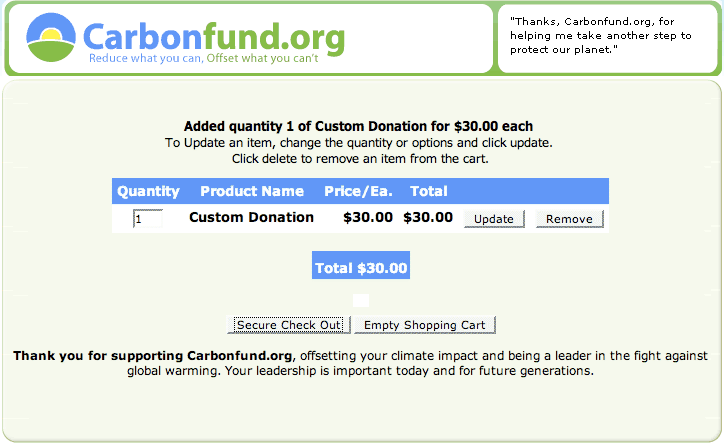 CarbonFund.org suggests a $49.88 offset for 11,000 lbs. of CO2. At this rate ($0.0045/lb. ), $20.48 should cover 4517.376 lbs. Adding $9.52 for a recent flight, I donated $30.00 to their 501c3 non-profit organization for 2008. It has been reported that renewable energy industries are having a lot of trouble in the present economic climate, which means that the necessary changes to the energy production processes that exist today are slowing down. Clearly individuals have a responsibility to do their part to reduce energy consumption. Through conservation, mostly, I reduced my power consumption over 2007 levels. I continue to cultivate a rooftop garden. This year's garden produced considerably more food than last year. It also covered up part of a black tar-paper roof that otherwise would have absorbed more solar energy. The solar power equipment I purchased last year has been a disappointment. But I will attempt to utilize it more effectively in the year to come. 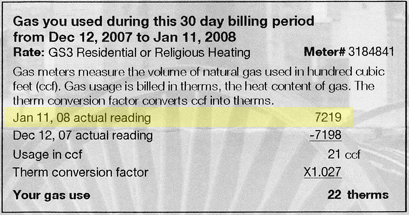 By comparing my utility bills from 2007 and 2008, I was able to discern that I'd used 2,230 kWh of electricity and 227 therms of natural gas. Using conversion factors provided by Terrapass.com, I calculated that I'd produced about 5,077 lbs. of CO2 during 2007. After doing some research to select a way of offsetting this use, I chose CarbonFund.org because it is a non-profit, and 93% of donations were applied to projects in 2006. Their carbon offset projects focus on renewable energy, energy efficiency, and reforestation. Using TerraPass.com's calculator, I arrived at a slightly lower, but similar CO2 footprint: 5,026 lbs. CarbonFund.org suggests a $27.50 offset for 11,000 lbs. of CO2. At this rate ($0.0025/lb. ), $12.69 should cover 5077.695 lbs. Rounding up, I donated $13.00 to their 501c3 non-profit organization for 2007. This type of transparency is intended to promote openness about environmental practices. I am making energy use related to my websites an issue to demonstrate a real commitment to environmental responsibility. As the severity of the global warming crisis has become ever more clear in recent years, a lot of attention has been focused on prototypes for futuristic solutions. But a lot can be done today to reduce greenhouse gas emissions. To this end, in 2007, I purchased solar power equipment and replaced all my remaining incandescent bulbs. Over the summer I cultivated a garden on the roof of my apartment building. These are just a few examples of ways that together we can curb our bad environmental habits and establish a culture of responsibility concerning energy use.